Android on your Eee, anyone? Ever since it was first talked about, Android has been an exciting prospect and its use on netbooks as well as mobile phones has been on the books since day one. Acer claims to be launching an Android-based netbook later this year, and we expect other laptop makers to do the same. Right now, though, the project needs a lot of work to make the transition from phone to desktop a smooth one. There are guides on compiling the Android source code for your x86-based netbook, but even when you've got it, it's lacking even the most basic of netbook functionality. You won't get support for your mouse, let alone wired or wireless networks. Without internet access, you won't find much in the way of software support, either, even a basic word processor. It's going to take a lot of work and an official netbook launch before we see this being a grown your own option, but it's definitely worth keeping an eye on. And if you're happy tinkering, it can be fun to try. Gadgets 3.1 is the latest version of gOS publicly available. 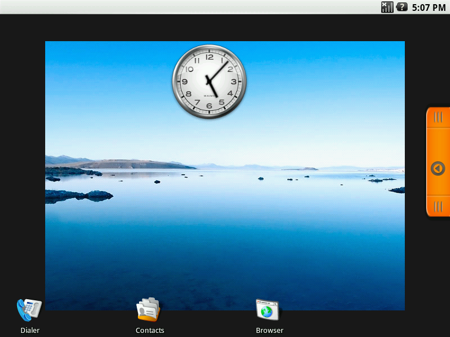 Even so, it's based on Ubuntu 8.04 'Hardy' which is now over a year old. There's a new version, Cloud, on the way, and it's more netbook-centric than Gadgets. However, it's focused on linking your netbook to online applications and it's designed to act as a quick-access environment alongside Windows. In the meantime, though, we still have Gadgets. 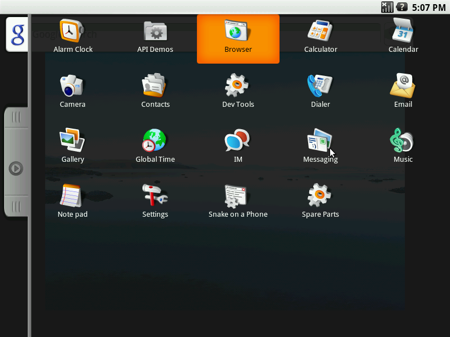 More than just a re-spin of Ubuntu, gOS Gadgets looks and feels incredibly different. 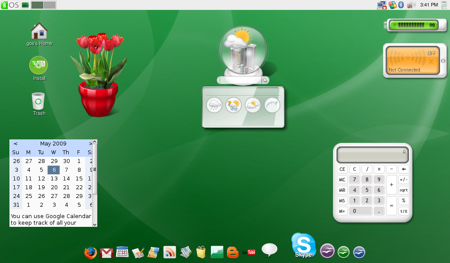 Google Gadgets have been integrated into the desktop and the Mac OS X-like dock has icons for every cloud-based service Google offers – as well as other popular services. The dock works really nicely, but from our experience most of the Google Gadgets are a little pointless or Windows specific. Certainly the the choice of installed software is impressive, with Skype as standard, plus the Windows emulation environment Wine, Picasa for pictures and Thunderbird for email. Clearly some thought has gone into choosing these, with a look and feel that matches its modern outlook. Unfortunately, wireless wouldn't work on any of our machines – and neither would our 3G dongles. Decent 3G dongle support was added in the Ubuntu 8.10 'Intrepid' release, which came six months after Hardy, which just goes to show how far behind the curve Gadgets really is. That said, gOS is very promising and certainly worth a look – if only to work out what packages you should install onto Ubuntu to get a similar look and feel. Hopefully, Cloud will be publicly available and exceed our expectations. If you fancy giving 3.1 a go, with enough Googling, you'll find ways of activating your wireless and maybe even get your dongle working. The instructions should be the same as it would be for Ubuntu.